It amazes me that people are willing to pay others $15 to string their guitars for them. 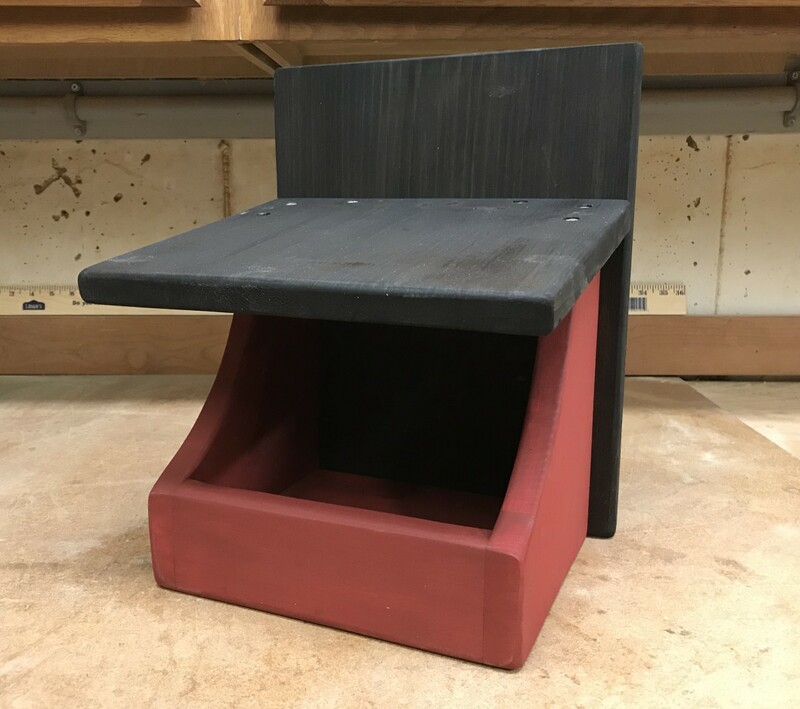 If you play, why not do it yourself? It's mostly not that hard. But there are a couple of tricks of the trade that can make it easier, neater, and less frustrating. And they'll let you avoid a result that looks like the strings you can see in the picture below and to the right. Not the way your strings should look! Before we start, a couple of caveats: the instructions here are for tuning a steel-string acoustic. 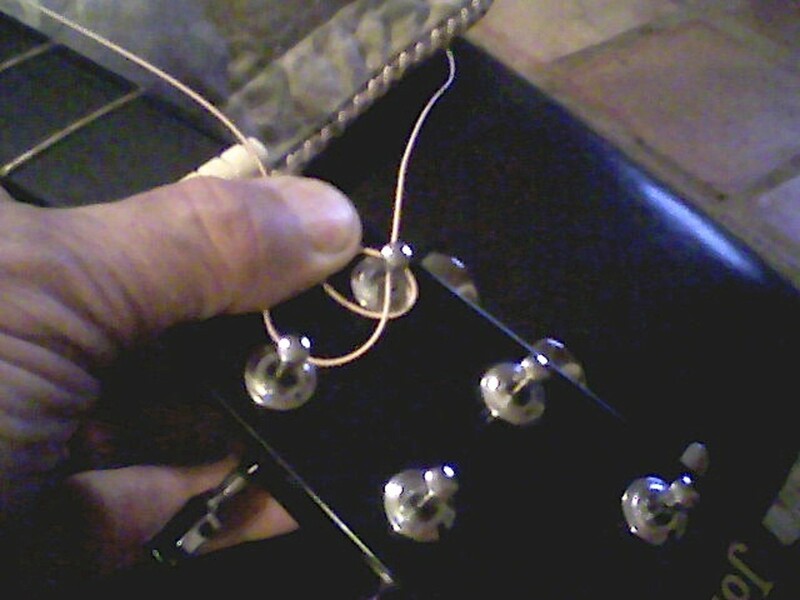 Most electrics can be restrung in much the same way as described below--but not all. In particular, guitars equipped with Floyd Rose-style tremolos are quite a bit more involved (though not an unreasonable task for most owners.) 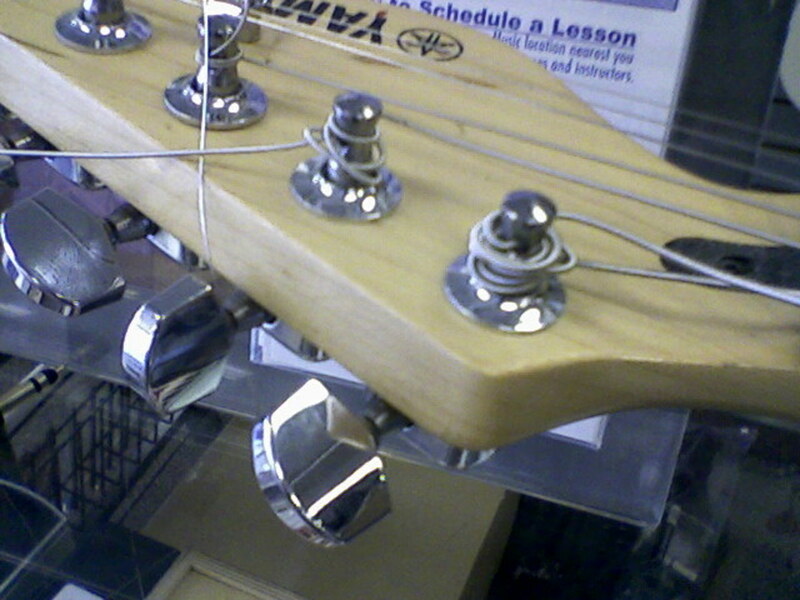 Such guitars are not covered in this Hub; to restring one, you should seek out specific instructions. Classical-style guitars also differ significantly from the model presented here. 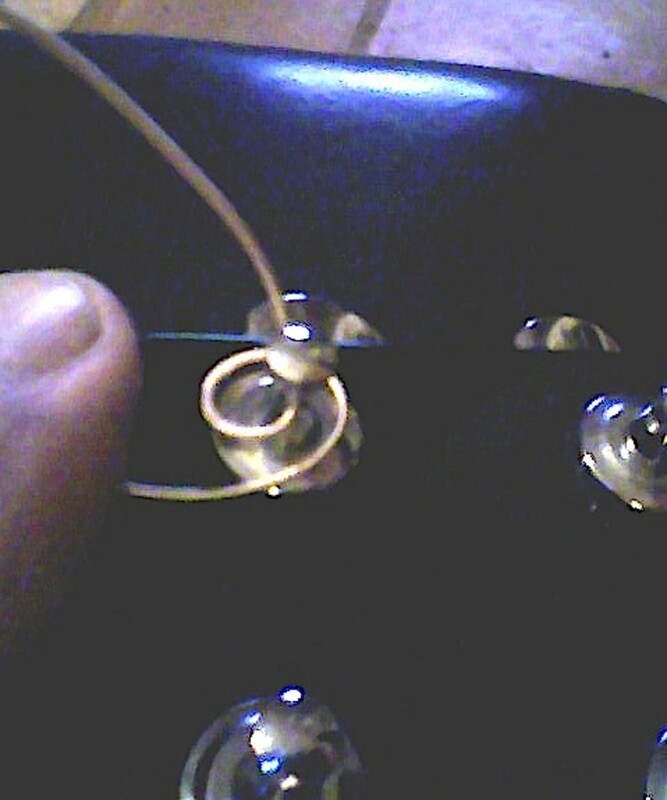 They usually use strings without a ball end; the strings are secured to the bridge by figure-eight-style knots without the use of bridge pins. Otherwise, classical guitars can be strung in a similar fashion to steel-stringed instruments. The picture above shows you what you need to restring your acoustic guitar: a peg winder/bridge pin puller, a side cutter to trim the strings, a tuner, polish, a clean cloth, and of course, the new strings. 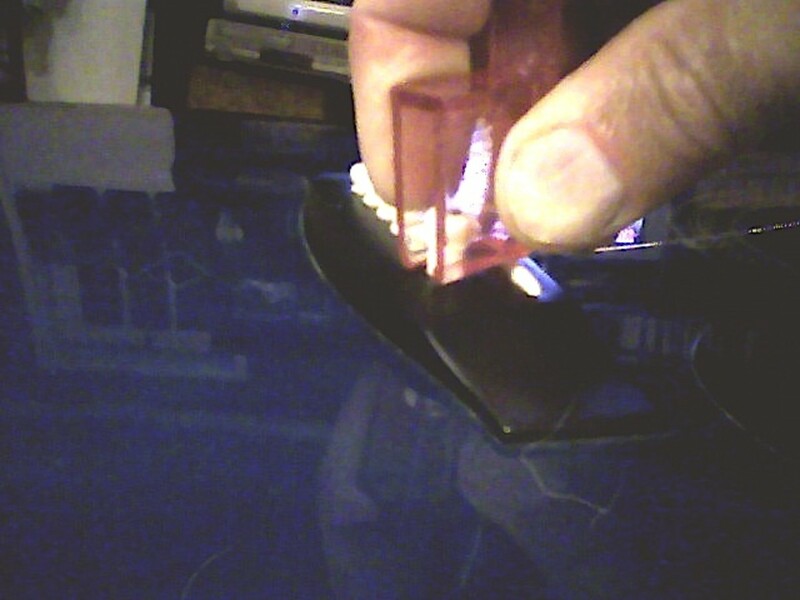 There are also fretboard cleaning fluids available, and some folks like to use a small brush--an old toothbrush, say--to really clean the fretboard. Start by detensioning the old strings. Apply the peg winder as shown, and figure out which way to wind. (I just pluck the string and turn the peg--if the note gets lower, that's the correct direction.) Unwind the string until it is loose--I like to pull the end of the old string out of the peg, so I'll loosen the string until there is just enough slack to do so. Some folks prefer to cut the strings free, in which case you don't need quite so much slack. If the strings are wound multiple times around the peg in "rat's nest" style, it may be easiest to cut them, then use needle-nose pliers to help undo the string ends. Just make sure they are fully detensioned first! 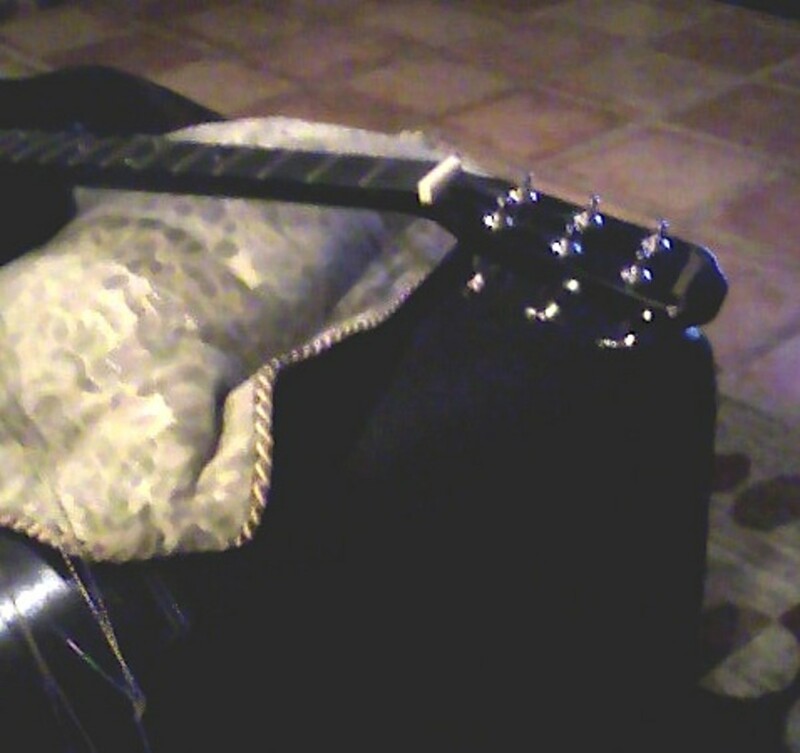 The strings off the neck; pillow propping up guitar. 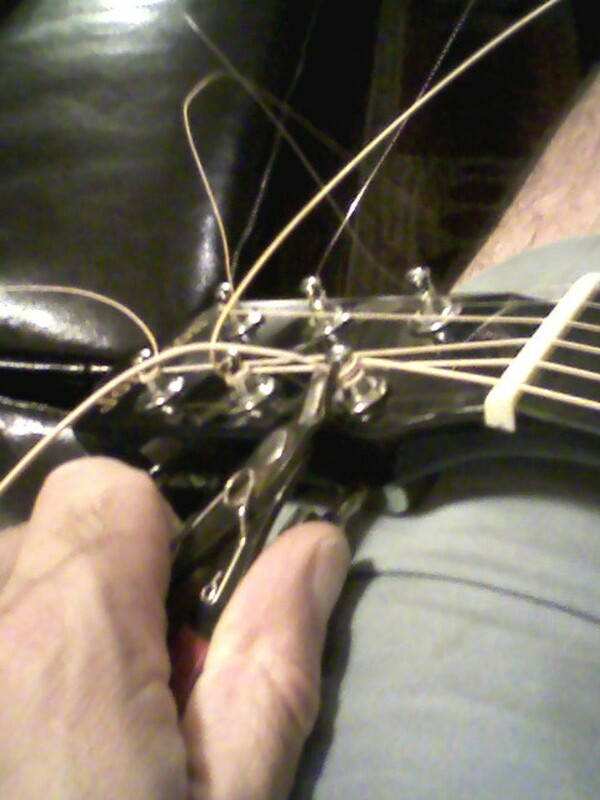 Some folks like to remove and replace one string at a time. 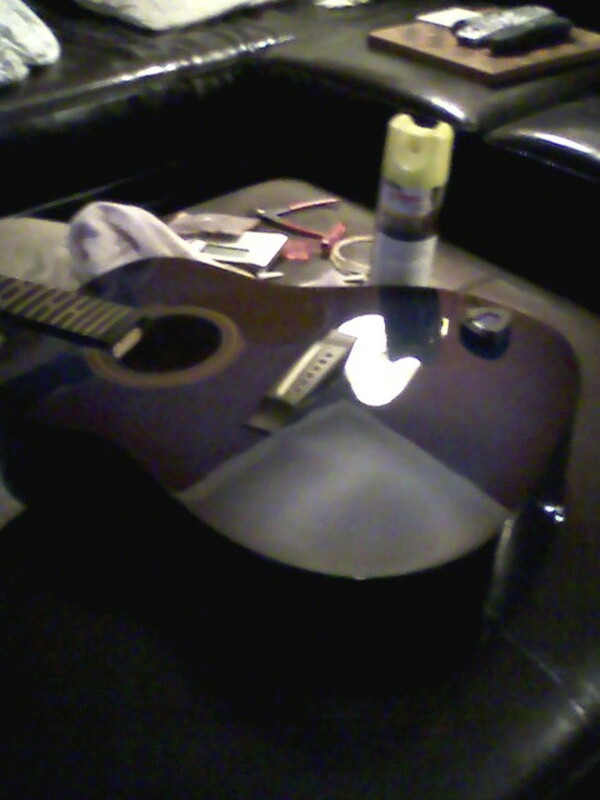 But if you do that, you'll never have such a golden opportunity to clean fretboard and guitar top. The worry that having no string tension for half an hour will somehow damage the guitar is, in my humble opinion, unnecessary and unfounded. Perhaps a sudden release of tension--such as that caused by cutting a string without detensioning it first--might do so, but not a normal (and temporary) removal of the strings. Here's how you remove a bridge pin. Make sure you've detensioned the string as shown above! Then carefully slide the pin puller around the top of the bridge pin, starting from the bridge saddle side as shown. It's much easier in that direction than if--as I did the first few times--you start from the lower side. Then gently lever the pin out of the bridge and set it aside. Having all strings off is a great opportunity to clean the fretboard and polish the top, as has been done here. 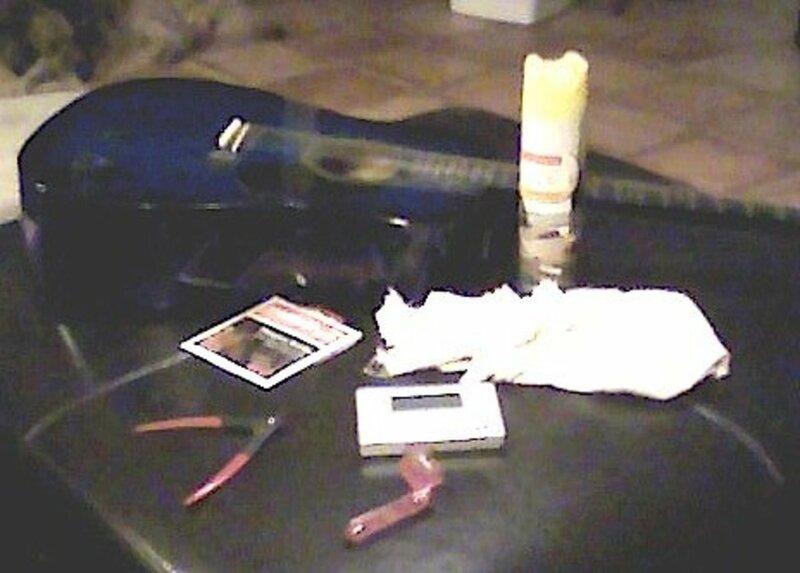 When you've removed all the strings it's your cue to clean the guitar up, as shown in the picture. Isn't that freshly-polished top pretty? Though ukelele never quite goes away, now it's 'back again.' But being heard in a band situation can be tough without a pickup. Here's how to install one without much fuss or expense. Once you've done cleaning (and admiring your handiwork), start restringing by inserting each string in the appropriate hole in the bridge. Put the bridge pin back into the hole with the grooved side facing toward the bridge saddle--the string will fit neatly into that groove. As you gently pull the string taut against the pin, push the pin firmly home into the bridge saddle. Sorry I don't have pictures of this part, but hopefully this description will be clear enough! 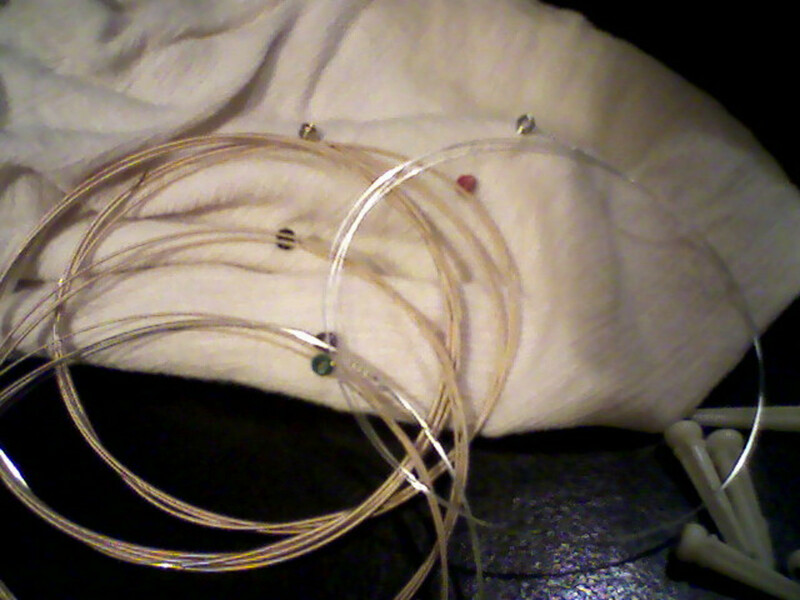 A set of new strings, just out of the envelope. These are D'Addarios, and have color-coded ball ends. But which strings should you use? Well, definitely strings from the right category. Putting electric string sets on an acoustic or vice versa is not a good idea; nor is mixing nylon strings with steel-string instruments or the reverse. Beyond that, choose a good brand--either one of the major companies who make strings, such as Martin, D'Addario, Ernie Ball, Fender and so on, or a specialty manufacturer in whom you have confidence. Guitar strings are not expensive--$5 to $7 for a set of plain strings as of this writing--so there is little reason to skimp. More expensive are "coated strings," which have some sort of protective coating applied. 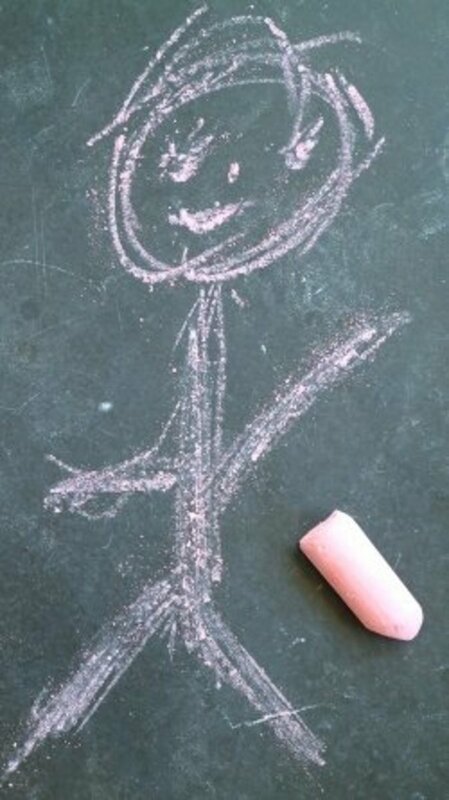 This coating prolongs string life and liveliness, hopefully justifying the extra expense. Finally, make sure that you select appropriate gauge strings for your guitar and playing style. Acoustic strings are usually labelled "extra light" through "medium" (or sometimes "heavy," though these have become less easy to find.) Some guitars should not be "over-strung" because they simply not strong enough to withstand the extra tension over a prolonged period. (For example, according to the manufacturer, the Martin "Backpacker" should never be strung with anything but Extra-Light strings.) Check your guitar's paper manual or online specifications to see if your instrument has specific string requirements. In general, lighter strings result in less string tension, somewhat reduced volume and sustain, and a different tone, as compared with similar strings in a heavier gauge. So if your playing requires vigorous strumming or the use of a slide, you may favor heavier strings for tone, volume and reduced string buzz. If, on the other hand, you have a light touch or physical challenges to your left hand, play many bar chords requiring a lot of left-hand effort, or like to bend notes frequently or through large intervals, a lighter gauge of string may work better for you. Check with friends, other musicians you encounter, the folks at your neighborhood music store, or online for information on string preferences and advice on strings and playing style. All that said, most acoustics will do fine with Light or Extra-Light strings. Do one turn around the peg, then insert string through hole. When the string and bridge pin are in place, the next step is to attach the string to the peg. This is the part most often done poorly. 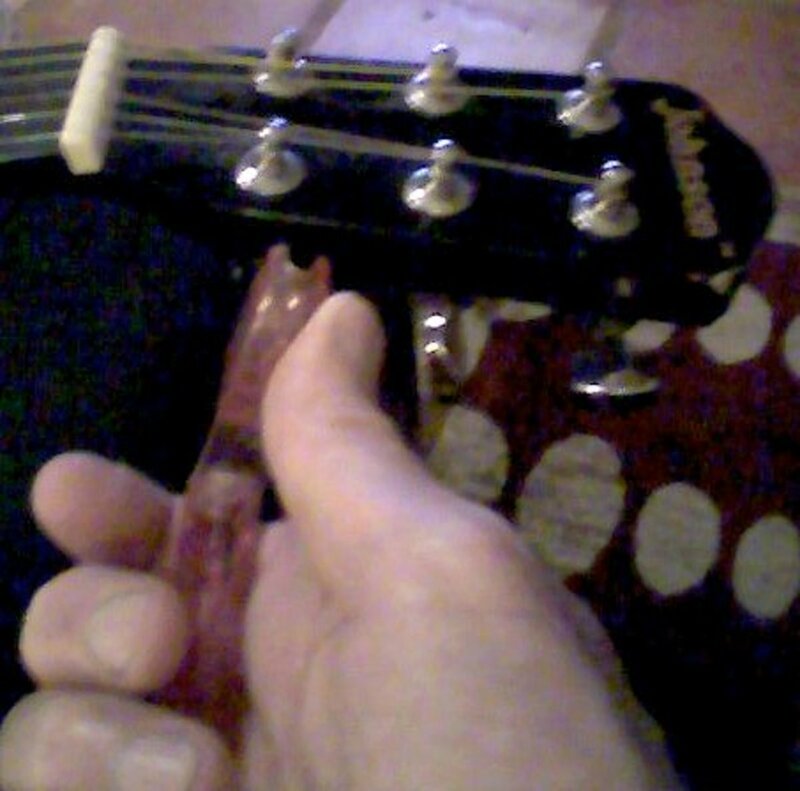 Begin by wrapping the string once around the peg--twice for the unwound upper strings, for greater security. (More times around the string are unnecessary and just set you up for the creation of an unruly "bird's nest.") It's a little tricky to get that one turn secured; the string will tend to "fight" you a bit, wanting to flip up and over the peg. 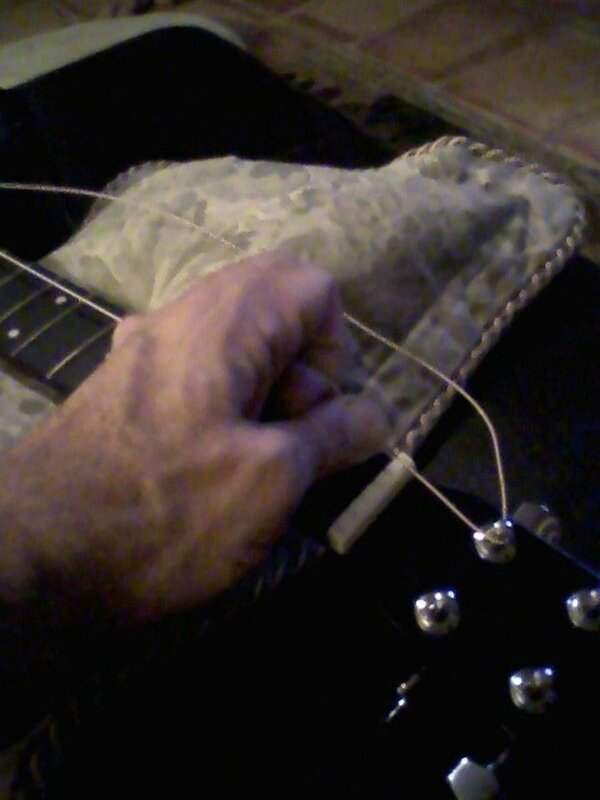 You can see me securing the loop against the headstock of the guitar with my thumb. As you wind the string tight--I prefer not to use the winder for this--it's important to keep tension on the string, both on the peg side and on the bridge side. Be careful that you wind the strings in the correct direction around the peg. For most acoustics, that will be the "inside" of the peg; but for inline "Fender-style" headstocks, it will be the side away from the tuner's "buttons." To keep the bridge pins from popping out of the saddle, and to ensure that the string winds smoothly and evenly onto the peg, you must keep tension on both sides of the string as you tighten it. You can see how I do that in the picture: the little finger holds the string down, low to the fingerboard, while the index finger and thumb pull the string tight. Gradually withdraw your fingers as the tension on the string increases. If you maintain tension, the string will wind evenly and neatly around the peg. It will look good, hold well, and be easy to remove when it needs to be changed in its turn. By the way, if you were wondering why there is so much string on the free side of the peg, it is because the guitar in the pictures is a 3/4-size instrument. The lesser scale length of the guitar means lots of excess string. Always clip with care. . .
With all strings safely installed, it's time to trim the loose ends. Actually, there are several schools of thought on this. Some folks like to trim the strings as they tighten them; some (especially in the case of some electrics) even like to trim them to length prior to installation. It must be admitted that excess string is inconvenient as you install the string. Yet I'm chicken--I can and have made errors in string installation. 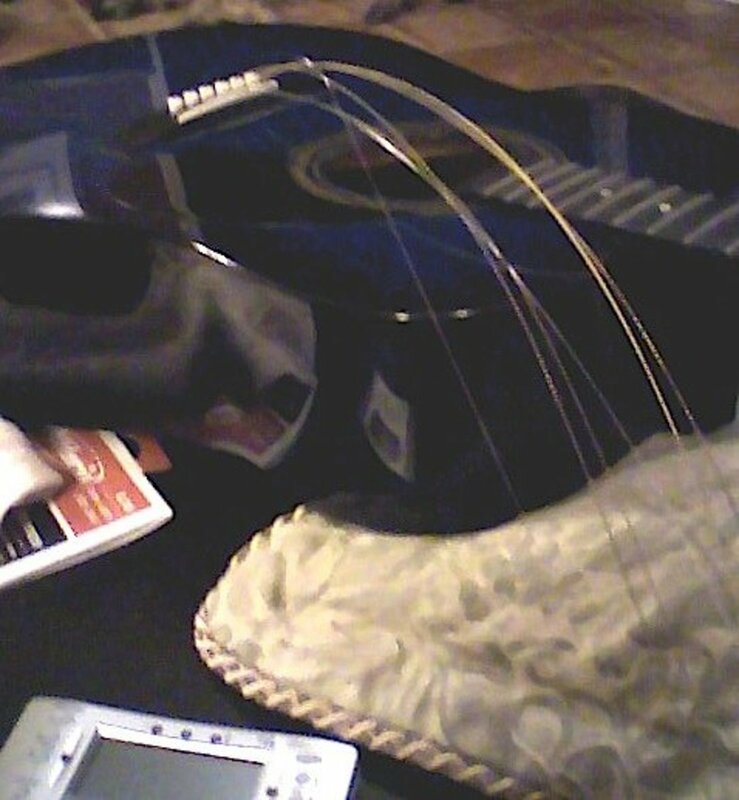 Cutting the string is about the only undoable part of stringing, which is why I like to leave it for last. Trim carefully; you definitely don't want to nick the string wound onto the peg, or, worse, cut the string below the peg! Here's where bending the string upwards at the peg pays off--this usually gives you good access to cut the string close to the peg. That's always good, as it helps to prevent future jabs to your hand from the sharp string ends! A chromatic tuner is a great help in tuning the guitar. Here, the leftmost LED is illuminated, showing that the string is flat. Tuning a guitar isn't too hard; the most important thing is knowing to which pitches you need to tune each string. For standard tuning, the six strings (lowest to highest) are tuned E-A-D-G-B-E. 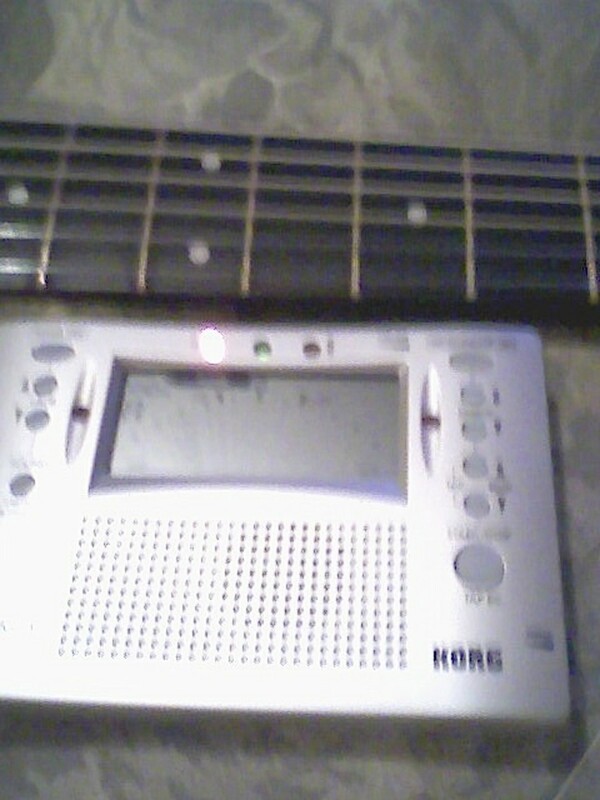 String 6, E; string 5, A; string 4, D; string 3, G; string 2, B; string 1, E.
A chromatic guitar tuner like the one shown is helpful: the screen will display the name of the note that it detects, and there are usually three LEDs to indicate whether the pitch is too low, or "flat" (usually shown by the left-hand red LED, as seen in the picture); correct (green center LED); or too high, or "sharp" (right-hand red LED.) Note names are arranged alphabetically, A through G, and then repeat. So, for example, if you are tuning the low E string (string 6), and the tuner says "D", then likely you can get to the correct note, E, by tuning higher (up the alphabet.) Be careful, though, about the scale's "wraparound"--there is more than one of each note name, which is why you hear terms like "high C," or "low E."
How can you tell whether you are tuning to the "right E?" Well, the string tension should be moderate. So if the string is too slack or too tight, you may be tuning an "octave" too low (slack string) or too high. In that case, you merely need to reverse course to get to the correct note. One other "music theory" bit that might help navigating your tuner--the basic alphabetic note names can be modified by the symbols "sharp" (high, written "#") and "flat" (low, written "b".) So, if your low E string is just a little too high, the tuner might say, not F or G, but E#. Similarly, if it's just a tad low, it might say Eb. It may sound complicated, but once you get used to it, the scheme isn't so bad. Good luck, and feel free to ask any questions you might have via the comment form! It always sounds worse when described in detail than it is in reality. A complete restring can usually be done in about a half hour, if you're prepared, organized and (of course) uninterrupted. Hopefully, I didn't make it sound too hard for people to do themselves--that wasn't what I was trying to do at all! That was interesting and I am amazed what all has to be done.